This popular resource delivers a thorough overview of every basic surgical term, concept, and technique. The essentials of surgery are concisely presented and abundantly illustrated. From tissue injury, local anesthetics, and surgical instruments.through obtaining hemostasis, skin flaps, scar excision and closure.to postoperative wound care, the 2nd Edition presents everything readers need to know to perform all of the maneuvers essential to surgical success. Two bonus CD-ROMs complement the text, using full-color animations and live-action video to demonstrate all of the skills step by step. Detailed illustrations and intra-operative photographs make every point clear. 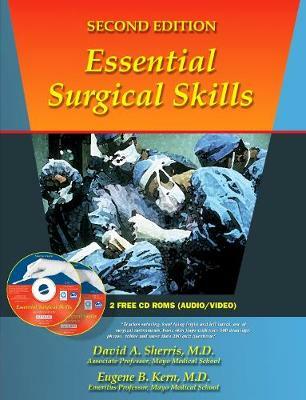 Video clips of operating room preparation and procedures show readers how to proceed-step by 17 quizzes throughout the book as well as a 100-question test (with answers) enable readers to assess their mastery of the material. CD-ROM #2 presents another 100-question test (with answers) that provides immediate feedback and scores as well as 25 randomized questions (without answers,) scored after the quiz is completed. New illustrations and animations demonstrate suturing and knot tying instructions for both right- and left-handed surgeons. A new section on endoscopic surgery includes suturing and knot tying, and new chapters address appendectomy and skin flaps. Expanded coverage of obtaining hemostasis reflects the latest knowledge, including topical hemostatic agents and the coagulation cascade. Includes up-to-date information on the latest surgical equipment, adhesives, and more.